◊ Made from durable Delrin. 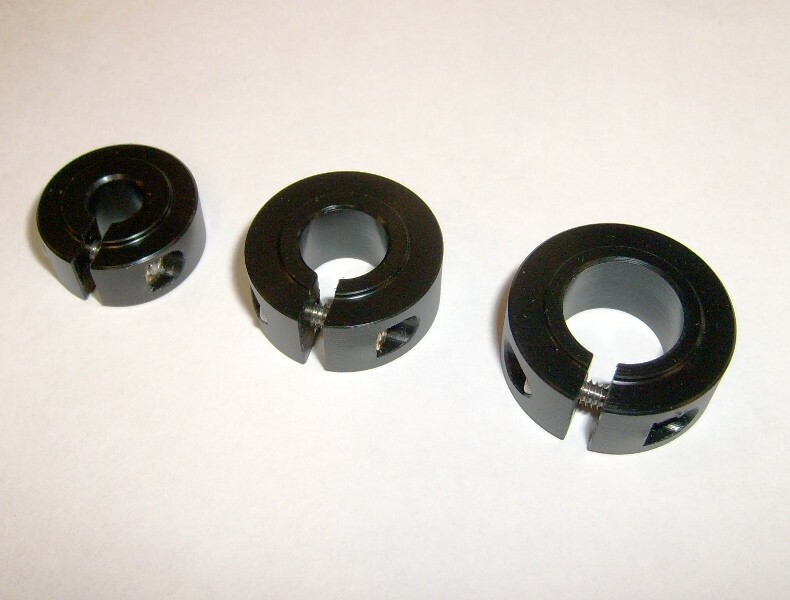 ◊ These clamp-on collars have more clamping strength than the set-screw type collars. ◊ A flat on the shaft is not needed. ◊ These collars will not damage the shaft. ◊ Tighten the screw about 1 turn past snug. Do not over tighten, a little torque will clamp these on really tight. For best results, retighten after a couple hours of use. .250" (1/4") .187" (3/16") 5mm (.197") 6mm (.236") 7mm (.275") $6.50 ea. you can change the qty in the cart. .250" (1/4") .312" (5/16") .375" (3/8") 5mm (.197") 6mm (.236") 7mm (.275") 8mm (.315") 9mm (.354") $7.00 ea. .250" (1/4") .312" (5/16") .375" (3/8") .437" (7/16") .500" (1/2") 6mm (.236") 7mm (.275") 8mm (.315") 9mm (.354") 10mm (.394") 12mm (.472") $7.50 ea.